My fiance and I are getting married Oct. 10th of this year and are doing a fall themed wedding. 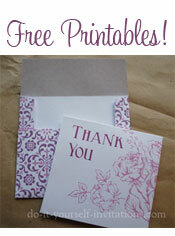 I wanted something different than all the other monogrammed, pocketfold, etc. invitations. Which by the way I think are Beautiful, just couldn't afford to buy them myself so I decided to make my own. I bought 12"x12" Scrapbooking paper called Autumn Memories. 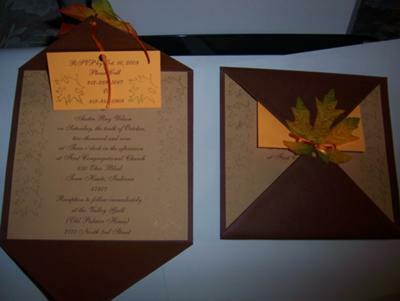 I cut the brown sheets in half to use for the outside of the invites and then folded the ends to a point, cutting holes at the points for the ribbon. I then took the cream/kinda tan colored paper and cut it into 6x6 squares and just used microsoft word to print the info on them. I used orange paper for my RSVP's, which are about the size of a business card. Since I didn't have a pocket or anything to put them in, I just hole punched the top and ran the same ribbon through it that I did the rest of the invite. 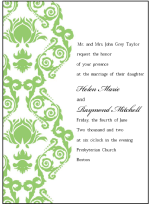 I went to hobby lobby and bought the leaf stamp and gold ink and stamped both sides of the invite and on each side of the rsvp. Once I got the ribbon through I hole punched a silk leaf and tied it all together!